Preferred Utilities Co. Inc. was listed in Polk's 1922-23 New York City Directory with company officers consisting of R. S. Bohn, president; J. S. Kaplan, vice president; and R. K. Archibald, secretary. Richard Stephen Bohn (1893-1956) was one of two Bohn brothers from Fort Wayne, Indiana, connected with Preferred Utilities. The other was his older brother, Gerald William Bohn (1885-1963). Both appeared in the 1900 U. S. Census as sons of William Bohn, age 45, born Pennsylvania, living at 285 West Berry Street, Fort Wayne, Indiana. At that time Gerald W. Bohn was 14 and Richard S. Bohn 8 years old. Richard S. Bohn appears in New York City directories in 1917 as manager of Wayne Oil Tank & Pump Co. with offices at 1790 Broadway, New York City. The Wayne Tank & Pump Co. manufactured gasoline tanks and pumps in Wayne, Indiana. This ad for the Wayne Tank & Pump Co. appeared in Automobile Trade Journal, vol. XXVI, no. 7, 1 Jan. 1922, pg. 182. In 1923 it was announced that Jacob S. Kaplan (1891-1964), who had trained as a forester at Yale University, had "resigned as city forester of Manhattan to accept a position with the Preferred Utilities Company, 1780 Broadway. New York" (Yale Forest School News, vol XI, No. 1, January, 1923). According to this report, "Jacob Kaplan has specialized in his Preferred Utilities Company on the sale of Ray oil burners for factory and home heating and power." The Ray Oil Burner Co. was represented by Preferred Utilities in New York City. This company manufactured oil burning heating equipment, and was established in San Francisco in 1872 as the W. S. Ray Mfg. Co. An early ad for the W. S. Ray Mfg. Co. dates from 1892, when products were mostly stoves and tinware. Much later this ad from 1919 features the latest model oil burning system. William S. Ray (1852?-1915), founder of the W. S. Ray Mfg. Co., seems to have had very little biographical attention. I found him in the 1880, 1900 and 1910 U. S. Census reports, living in San Francisco. These indicate he was born in New York (the 1900 census says February, 1850). In 1910 he was 60 years old, a stove manufacturer. The California Death Index registered William S. Ray, age 66, death 19 March 1915 at Napa, California. Findagrave has W. S. Ray 1852-1915 at Cypress Lawn Memorial Park, Colma, San Mateo County, California. 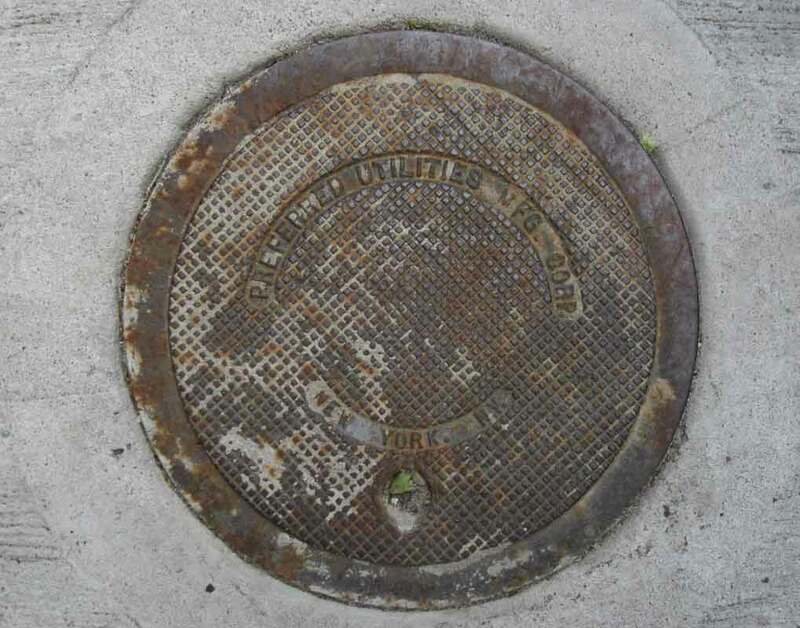 Other Preferred manhole covers are found on 5th Avenue at the corner of 20th Street, and 17th Street near the northeast corner of Stuyvesant Square. This Do Not Overfill sign must have been supplied by Preferred Utilities when they installed an oil tank here on 54th St. near 11th Ave., New York City.